Fig. 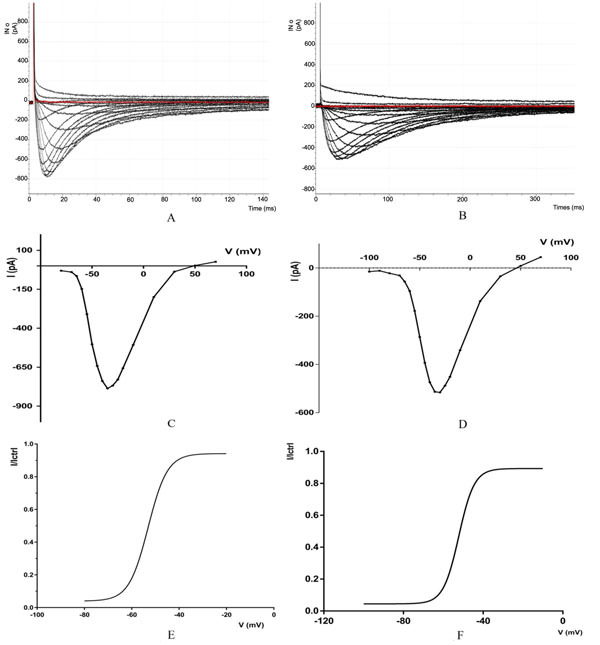 (1) Family of control CaV3.2 and CaV3.3 currents(A) Recoding of calcium channels CAv3.2 with IV protocol the selected current trace correspond to the following depolarizing voltage pulses (mV): - 80, -70, -65, -50, -45, -40, -35, (peak current), -30, -25, -20, -10, -10, -30, -50, -70 from a HP of -100 m V. (B) Recording of calcium channels CAv 3.2 with IV protocol, the selected current traces correspond to the following depolarizing voltage pulses (mV: - 100, -90, -80, -70, -65, -60, -55, -50, -45, -35, -30 (peak current), -25, -20, -10, 10, -30, -50, 70, from a HP of -100, -90, -80, -70, 65, -60, -55, -80, -45, -40, -35, -30 (peak current), -25, -20, -10, 10, 30 50, 70, from a IP of -100mV. (CD Mean current -voltage (1-V)) relationships of CaV3.2 (C) and CaV3.3 (D) currents. The HP of - 100 mV. (E.F) steady-state activation curves were obtained from the fitting of the 1-V curves. Steady -state inactivation for CaV3.2 (E) and CaV3.3 (F) currents.